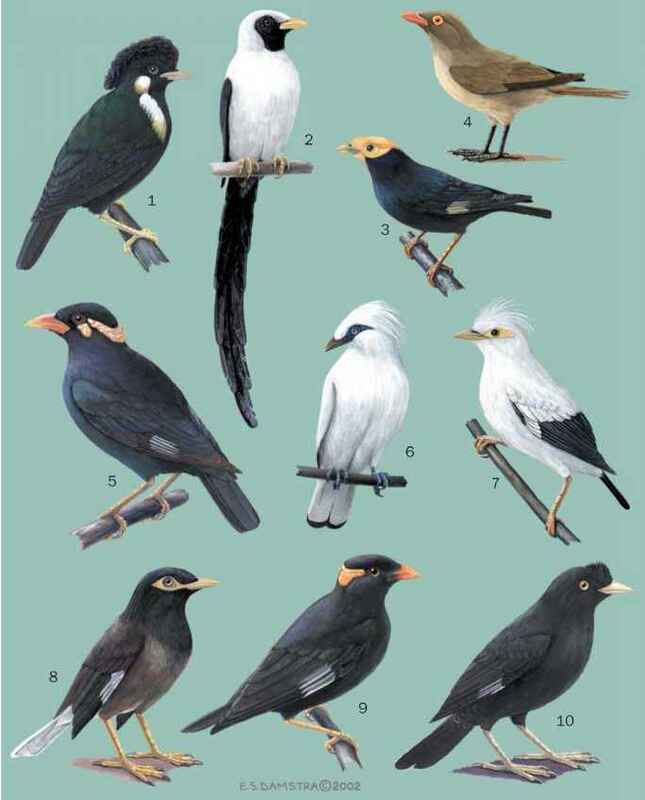 French: Sturnelle de l'ouest; German: Wiesenstarling; Spanish: Triguera de Occidente, Pradero Occidental. 8.5-9.5 in (21.5-24 cm); female 3.2 oz (89 g), male 4 oz (115 g). Sexes alike in color. Throat and underparts bright yellow, with a black V on the breast; yellow stripe over the eye; back, wings, and tail mottled with brown; outermost tail feathers white. tral Mexico and northern Baja California. 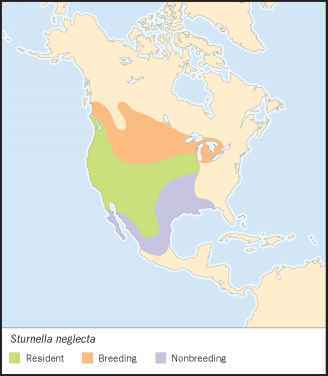 Winters from southern British Columbia and the central Plains to central Mexico and Baja California. Grasslands, pasture, savanna, and cultivated fields. Territorial during the breeding season. Males defend a territory with songs, fights, and chases. Flight songs are common. In winter, they are found in small groups. Forage almost entirely on ground, gathering grain, seed, and insects. Feeds mostly on insects during the summer, grain in winter and early spring, and weed seeds in the fall. Males often are simultaneously mated to two or more females. Females build a domed nest that is placed on the ground. Three to 7, most commonly 5 eggs are laid late April-early August. Incubation 13-14 days; fledging at about 10-12 days. Single brooded, but females renest if their first effort was unsuccessful. Not threatened. Widespread and common, but numbers declining in many areas. Agricultural practices affect breeding through habitat degradation, destruction of nests by equipment and trampling of nests by livestock. What are the physical characteristics of a western meadowlark?